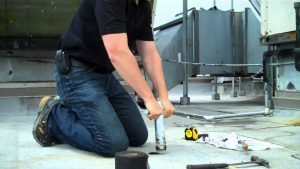 Home / Posts tagged "Flat roof survey"
If you are an asset manager, estate manager, building surveyor and are being asked to make a budget go as far as possible, then it is essential you get and give impartial advice to the building owner. By investing in an infrared thermographic survey, you mitigate risk from a third party advising whichever solution meets their commercial needs and wants. Thermal imaging can’t tell the difference between polyurethane and fibreboard. Wet is wet and that effects the temperature on the surface. Why? Simply put, wet insulation doesn’t insulate as well as dry insulation – so heat escapes the fabric. Also because water has a high emissivity. This means that water radiates its energy particularly well when it has finished absorbing it from the sun and from the building itself. This high emissivity makes the wet area appear warm to the infrared thermal camera. Drones are now extensively used to aide thermal imaging, thus eliminating most if not all health and safety risks for the surveyor as well as improving the accuracy of the surveying results, there is little not to like about infrared. A thermographic survey may help you save hundreds of thousands of pounds by turning what you had assumed would be a complete “strip and re-new” into a partial strip and overlay. Conversely however the opposite may be true.